The Olean Times Herald published an article on Diana's book signing for WNY Horse Resource. Please click here to read it. The Horse News published an article on Spirit of the Saluda River's release. Please click here to read it. Diana released her fourth children's book and first Easy Reader, Spirit of the Saluda River. For more information on the book, please click here. EquestrianMag.com ran a story on Spirit of the Saluda River's release. Please click here to read it. Straus Newspapers published an article on Diana's May book signings. Please click here to read it. Recorder Newspapers included the Animal Arts & Letters fundraiser for AniMeals in their upcoming events Potpourri. Please click here to read it. The Daily Record published an article on Diana's book signing at the Animal Arts & Letters fundraiser for AniMeals. Please click here to read it. Recorder Newspapers published an article on the Animal Arts & Letters fundraiser for AniMeals. Please click here to read it. The Horse News published an article on Diana's May charity book signings. Please click here to read it. The Observer-Tribune published an article on Diana's book signing at the May Animal Arts & Letters fundraiser for AniMeals. Please click here to read it. The Daily Record published an article on Diana's book signing at Sparta Books. Please click here to read it. The Horse News published an article on Diana's new website launch and holiday book sale. Please click here to read it. Strides Magazine, official publication of the North American Riding for the Handicapped Association, published an article on Janie's New Legs. Please click here to read it. 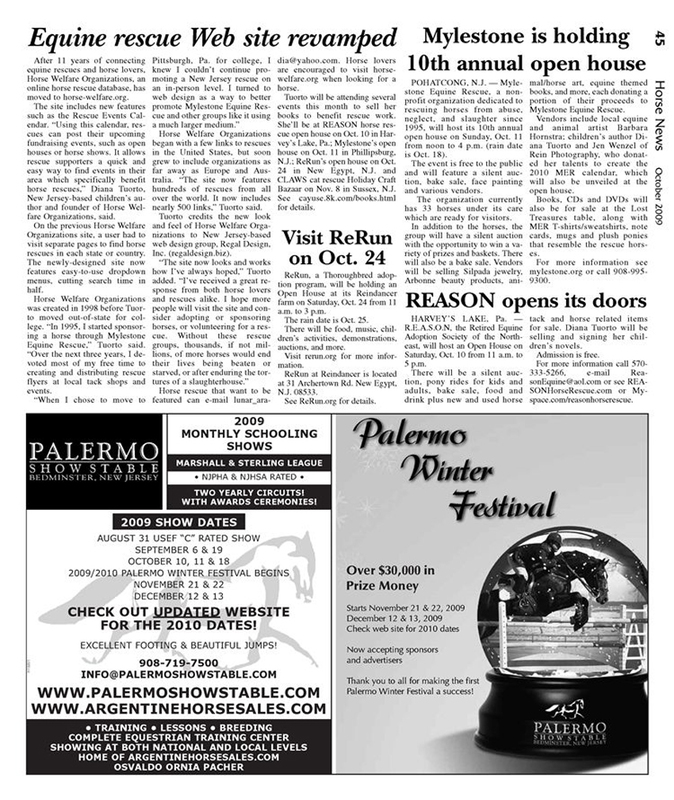 The Horse News published several articles on Diana's October book signings, as well as the re-launch of Horse Welfare Organizations. Please click here to read them. The Warren Reporter published an article on Diana's fall book signings. Please click here to read it. The Animals Voice featured My Desert Sun in their June newsletter. The Horse News published an article on Diana's May book signings. Please click here to read it. The New Jersey Herald published an article on Diana's appearance at the Northern New Jersey Pet Expo. Please click here to read it. The Horse News published an article on My Desert Sun's release. Please click here to read it. EquestrianMag.com and FreeBookClubs.com ran stories on Diana's May book signings at Somerset Hills Handicapped Riding Center and the Northern New Jersey Pet Expo. The Hunterdon Review published an article on Diana's book signing during Somerset Hills Handicapped Riding Center's May horse show. Diana re-released her first children's novel, My Desert Sun. For more information on the book, please click here. EquestrianMag.com and FreeBookClubs.com ran stories on My Desert Sun's release. Pitt Magazine featured Janie's New Legs in their Bookshelf section. Please click here to see it.